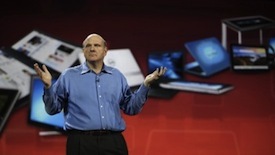 Microsoft WPC: Can Ballmer Prove Windows 8's Worth? Microsoft WPC: Can Ballmer Prove Windows 8’s Worth? Microsoft CEO Steve Ballmer is set to address thousands of technology partners July 9. Microsoft CEO Steve Ballmer is set to address thousands of technology partners July 9. His keynote, scheduled for Microsoft Worldwide Partner Conference (WPC12) in Toronto, will need to communicate Microsoft’s cloud momentum while assuring partners that the company’s Windows 8 strategy across desktops, notebooks, tablets, and smartphones will unlock new profit opportunities. Can Ballmer deliver the goods? Hmmm… Here are five inflection points worth noting. First, the good news. Microsoft is in better shape today than the company was roughly two years ago, when the Windows 7 and Office 2010 launches dominated WPC 10. That conference was about fixing the old Windows Vista debacle, even as the rest of the IT industry was moving onto smartphones, tablets and cloud discussions. By WPC 11 in July 2011, Microsoft was finally ready with Office 365. 1. Windows Server 2012 and Windows 8: In recent days, The VAR Guy has heard from numerous partners who say the company’s imminent upgrades — Windows Server 2012, Windows 8, etc. — represent a strong product pipeline. While Ballmer balances the on-premises and cloud messages, Microsoft is wisely trimming back the number of Windows 2012 Server versions — though some partners are upset about Windows Small Business Server’s death. But Microsoft wants those SBS partners to shift to the cloud. And some partners, such as Salon, say they are making serious consulting revenues from Office 365 deployments. 2. Windows Azure Trumps Office 365? : Still, a lot of partners have yet to engage on the Office 365 front — where Microsoft sometimes seems to be focused more on an Office 365 price war with Google Apps rather than partner wins. If you check the agenda here at WPC 12, Microsoft seems to be putting a lot of the cloud spotlight on Windows Azure, SQL Azure and System Server (for private cloud management). There’s very little Office 365 on the conference agenda… But perhaps Ballmer will pitch the cloud suite during Monday’s keynote. 3. Skype and Yammer: Meanwhile, The VAR Guy thinks Microsoft’s buyouts of Skype and Yammer could pay big dividends for partners over the long haul, but Ballmer must explain to partners how those offerings will converge with Exchange, SharePoint and Lync in particular. 4. The Rivalries: Sure, Ballmer may mention Apple, Google and VMware in his keynote — but don’t expect too much competitive posturing from Microsoft’s CEO. At this annual conference, COO Kevin Turner typically delivers bombshell competitive statements and he won’t be onstage until Wednesday, July 11. That day, Channel Chief Jon Roskill will open with his views on the Microsoft Partner Network, with Turner sharing his vision for competing to win. 5. The Big Questions: Of course, the biggest questions remain around Microsoft’s tablet and smartphone strategies — each of which hinge on the Windows 8 launch later this year. Some partners here are concerned that Windows 8 won’t deliver much business value — though there are numerous business-centric Windows 8 sessions here. Others say Ballmer’s Surface Tablet announcement in June was underwhelming compared to the complete system Apple’s iPad offers. Charles Thomas Gruhler, a technology marketing executive and branding strategist who will talk up Windows Phone. The VAR Guy has arrived at WPC 2012. Soon, we’ll know if Ballmer and a new, more sharply focused Microsoft has arrived as well. What a chunk of balloney, Nico. You are on to the same tactics that were used for WP7 and Vista. It’s the same mumbo jumbo that Nokia blogs, WMpoweruser and similar sites are on to. Blatant lies – with the intention to show off a product as an succsess even when it fails. The MSN Money statement is pathetic as the WP7 flop is a consequence of minimal Lumia sales. Even Nokia N9 had higher total sales than Lumias by end of Nokia Q1. Trouble is that Microsoft believe that tiles (metro) is the best thing ever. If that was a fact – they would have gained a significant market share by now. Didn’t happen. And that means trouble for W8 on desktop/laptop where Metro is significantly worse – and half baked. What should be of your/Microsoft’s concern is that neither Android users nor iOS users cares about Windows 8 whatsoever.